Clay Paky has introduced four compact 300-watt moving yoke projectors: Alpha Beam 300, Alpha Spot HPE 300, Alpha Spot 300 and Alpha Wash 300 washlight. Alpha Beam 300 pro-duces a parallel beam, similar to that of an ACL. Alpha Spot HPE 300 features zoom, CMY, 8+1 color wheel, 15 gobos, morphing effect, rotating prism, frost, dimmer on dedicated channel, iris and strobe. Alpha Spot 300 features two 8+1 color wheels, 15 gobos, morphing effect, rotating prism, dimmer on dedicated channel and strobe. Alpha Wash 300 features CMY color mixing and 8+1 color wheel, two levels of frost, dimmer on dedicated channel and strobe. American DJ’s Accu Series now has two new LED-powered moving heads — the Accu Spot 250 Hybrid, shown here on top, and the Accu LED MH. The Accu Spot 250 Hybrid com-bines a 250W discharge lamp with nine 1-watt LEDs (3 red, 3 green, 3 blue). Features include seven replaceable rotating gobos plus spot (two dichroic glass gobos), nine colors plus white, sound active mode with built-in programs, RDMX remote DMX addressing, auto X-Y repositioning, 360° pan/ 265° tilt and a four-button menu system. It has a beam angle of 15° with an optional 18° beam angle (sold separately). The MSRP is $1,399.95. The nine-DMX channel Accu LED MH is a moving head with 69 red, green and blue LED beams that produce an output similar to a 250W halogen lamp, while consuming less power. Its MSRP is $999.95. 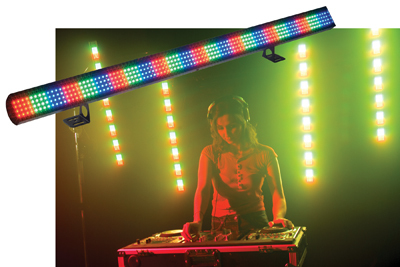 American DJ’s new Mega Pixel LED is a color bar with 384 LEDs that produce moving patterns and chases. It measures one meter long and has 128 red, 128 green and 128 blue 5mm LEDs arranged in 24 color banks of 16 LEDs each. American DJ’s new Quad Gem DMX is a four-lens effect with 224 red, green, blue and white LEDs configured in groups of 56 per lens. The LEDs project four moonflower ef-fects from a single unit. The highly portable, DMX compatible unit was designed for DJs and clubs. It consumes 20 watts of power and the LEDs are rated at 100,000 hours. The Quad Gem DMX features 12 built-in programs, fast to slow strobing, and 0 to 100 percent electronic dimming. It can be operated in three modes: sound active, DMX, or with American DJ’s UC3 optional universal controller, sold separately. 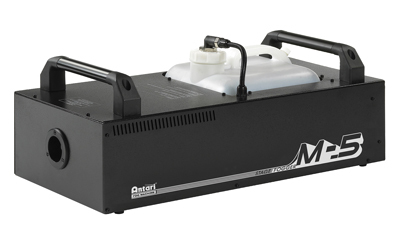 The new Antari M-5 Stage Fogger from Elation Professional is a 1,500-watt fog machine designed for stage and touring applications. Featuring a low-profile rectangular housing, the M-5 Fogger is designed to be unobtrusive. Two handles allow for easy transport and its 10-liter tank provides extended operation. With a warm-up time of eight minutes, the machine can produce 20,000 CFM. The M-5 weighs 33 pounds and includes a timer remote and onboard DMX-512. Optional accessories include a wireless remote and a heavy-duty flight case. Measuring 26”L x 12.5”W x 6.7”H, the Antari M-5 fog machine has a suggested retail price of $799.95. 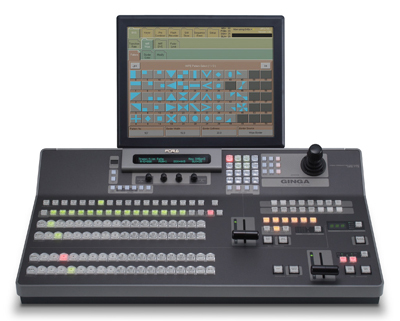 FOR-A’s VPS-715 GINGA switcher contains all the features of the VPS-700 in a 1.5 M/E digital switcher. The VPS-715 includes frame synchronizer for every input, up to 16 SD inputs and outputs, six keyers and six channels of 3D DVE. It has a large control panel, consisting of 16 primary input buttons: PST/PGM (Preview/Program) BUS, ME (MIX/EFFECT) BUS, KEY/FILL BUS, AUX BUS and function keys. A newly added feature on the VPS-715 is its VPS-70FR flash recorder option which allows 120 seconds of uncompressed video recording and provides two channels (Key/Fill) with simultaneous playback for video insert, CG wipe or slow motion playback. The switcher’s fader link function allows for manual playback control as well. The VPS-715 is equipped with redundant power supplies for the MU and OU as standard. As an option on the VPS-715, users can add 2D DVE in every input, delivering up to 32 DVE channels and total flexibility for multisource productions. It supports the 525/60 and 625/50 standard definition formats. 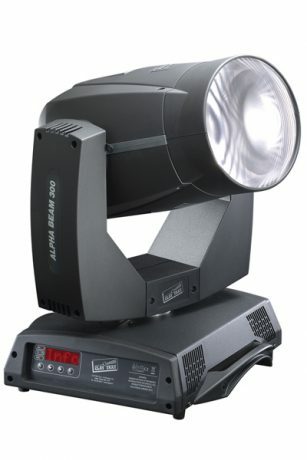 Robe Show Lighting’s new ColorSpot 2500E AT is Robe’s most powerful moving light fixture to date. It features an MSR Gold 1200 SA/SE FastFit lamp with a 1400W electronic ballast, a parabolic glass reflector, focus lens, multi-step zoom lens (10°–30°), anti-reflection coating, a CMY color mixing system with 63 color macros, color correction from 5600 to 3200K, a color wheel with four dichroic filters, a UV filter, a 6000K filter and white, two gobo wheels, an effects wheel with 3- and 5-faceted prisms and 2 glass effects, a 1-15 FPS variable speed strobe, iris and frost. The 1,500-watt fogger features a piston pump and continuous duty operation. Up to four machines can be daisy-chained and it runs from a DMX512 input or a timer remote. 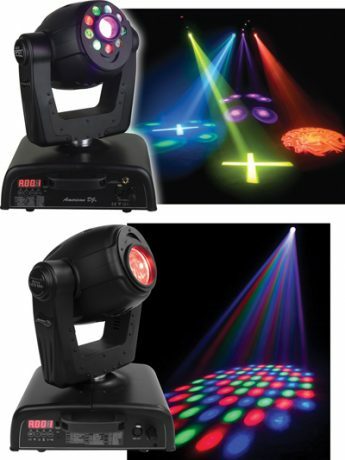 The standard unit with a piggyback remote retails for $695 and the DMX512 version retails for $795. American DJ’s P36 LED Blinder and P64 LED Blinder combine multiple LED fixtures onto one unit. The P36 LED Blinder comprises eight P36 LED pinspots, while the P64 LED Blinder has four P64 LED PARs. 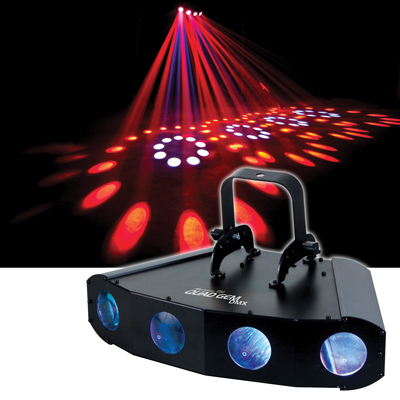 They can be set up either on the floor or mounted on American DJ’s LTS-6 lighting stand. The RGB color-mixing fixtures have low power consumption, long life, produce little heat and are DMX-compatible; they can operate with any DMX-512 controller. Both units offer direct DMX connection with no external components required. The MSRP of the P36 LED Blinder is $799.95 and the P64 LED Blinder is $999.95. ETC is introducing new Source Four field angles, including 14˚, 70˚ and 90˚. The new 14˚ Source Four provides an intermediate-throw field angle to fill the gap between the 10˚ and 19˚ fixtures. Short-throw applications such as blackbox theaters and dance lighting will benefit from the 70˚ and 90˚ Source Fours. The Source Four Enhanced Definition Lens Tube (‘EDLT’) option was introduced at LDI 2005 and will soon be available in 19˚, 26˚, 36˚ and 50˚ field angles. The EDLT enhances gobo projections in both HPL and HID-equipped fixtures.